"divide" key is meant to wake up. Other keys don't wake up. This is normal to minimize accidentally wake up when carrying the calculator inside the pouch. GPS module needs more current and I observed, that low batteries will reset the circuit when GPS is switched ON. Perhaps you just have to recharge the batteries. Did you measure the /SHDL signal at the Power supply. If it is always high and battery is low this could explain the behavior. Yes, wake up works as expected. I didn't get as far as measuring the /SHDL signal. It is low now, but I can't switch on GPS mode, all I can do is enter zeros by pressing whichever key I like. On wake-up I am greeted with the usual startup screen, so the display works, but something is wrong with the keyboard scanning. (01-09-2018 10:39 PM)Harald Wrote: Any idea what the problem might be? 1.) First I do not recommend to solder the LP circuit without sockets, because you can never remove it without misaligning or loosing all these pins. It is a lot of work to solder them again properly aligned. The LP should work with low profile sockets. I made two units, which can be closed nicely. 2.) I assume the keyboard connector is plugged in the right way, because the "div" key is working. If it is plugged in the wrong way, this doesn't harm anything, but keyboard rows and PRGM/RUN switch are in wrong order. 3.) Does the PRGM/RUN switch work? 4.) Did you remove the original ACT chip? I never tried with it, because both of my units had it already removed. Perhaps it pulls some keyboard lines low? 5.) Does it make a difference if you disconnect the Bat+ from the GPS supply? 6.) 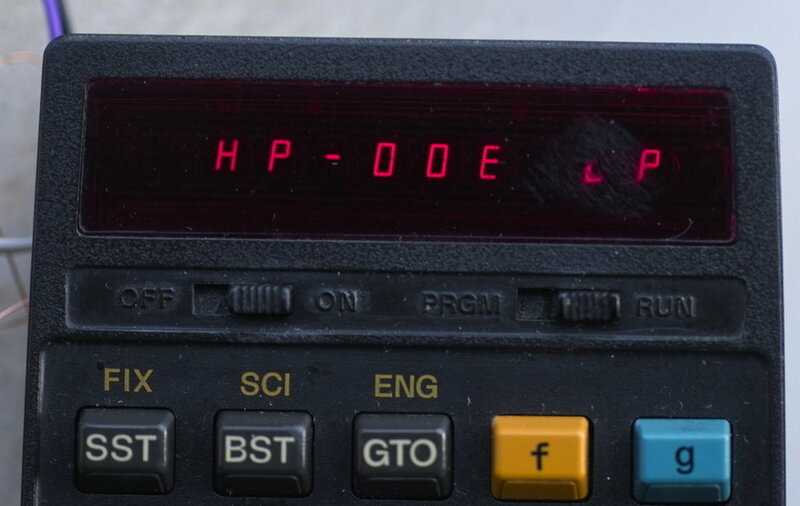 If the display shows "HP-25 LP" at startup, this proves that the PIC is OK and all socket pins (9+3+3+3+3+1) display driver pins are connected properly. 7.) The problem must be located at the 5 keyboard lines. Perhaps there is a short in one of the keyboard lines? 8.) Can you double check, that you did not exchanged the GPS /SHDL and GPS data signals inadvertently? But this would not explain the keyboard issue. (01-09-2018 11:42 PM)PANAMATIK Wrote: 1.) First I do not recommend to solder the LP circuit without sockets, because you can never remove it without misaligning or loosing all these pins. It is a lot of work to solder them again properly aligned. The LP should work with low profile sockets. I made two units, which can be closed nicely. I needed to remove half of the sockets because the spacing between the anode and cathode driver was different on my PCB. I then inserted your PCB and realised it didn't sit low enough. maybe the pins on this late 25c are a bit shorter. I couldn't get the LED module to make proper contact. So I removed the remaining sockets and soldered the pins directly to the PCB. Quote: 2.) I assume the keyboard connector is plugged in the right way, because the "div" key is working. If it is plugged in the wring way, this doesn't harm anything, but keyboard rows and PRGM/RUN switch are in wrong order. Yes, I double checked that. Quote: 3.) Does the PRGM/RUN switch work? Quote: 4.) Did you remove the original ACT chip? I never tried with it, because both of my units had it already removed. Perhaps it pulls some keyboard lines low? I removed all the components except the charge resistor and diode and one resistor below the display. Quote: 5.) Does it make a difference if you disconnect the Bat+ from the GPS supply? No, it makes no difference. Quote: 6.) If the display shows "HP-25 LP" at startup, this proves that the PIC is OK and all socket pins (9+3+3+3+3+1) display driver pins are connected properly. Quote: 7.) The problem must be located at the 5 keyboard lines. Perhaps there is a short in one of the keyboard lines? I will have to check this more carefully again. Edit: I checked all 6 lines on the keyboard connector against each other. The lowes resistance I could find was 80kOhm. Most of them are above 1MOhm. Quote: 8.) Can you double check, that you did not exchanged the GPS /SHDL and GPS data signals inadvertently? But this would not explain the keyboard issue. That was what I was trying to achieve by measuring the /SHDL signal and then turning on an off the GPS. Unfortunately this doesn't work anymore, as I can't type anything but zeros :-| I'll have to solve that problem first. (01-10-2018 09:17 AM)Harald Wrote: Thanks for your support! I will support any case until everything works! PM sent. Some information about the support for the Woodstock LP circuit ? Harald's circuit could be repaired quickly by reprogramming the external flash data. Somehow it lost a flash page which contained keyboard codes. The new firmware version 1.02 now uses a flash write protection scheme, which should avoid accidental loss of data. There was another circuit with the same problem, both had the GPS module installed. But there are also some GPS versions 1.00, which did not have any problems, as mentioned in this thread http://www.hpmuseum.org/forum/thread-9936.html. If you have firmware version 1.00 there is no need to update if the calculator works normally. There were 15 LP circuits built and sent in january. Three of them (including the above) needed a repair and were sent back to me. Meanwhile all of them are repaired. I'm more and more relieved because the feedback about LP circuit seems to be great and all of the boards are working. I still have 5 circuits from the first batch here, which could be ordered. I plan to manufacture some more in this year if there is still demand. Next step will be to finish the Woodstock LP application for USB communication and upload/download. Nobody has discovered the hidden feature yet. Hm... but shouldn't be too difficult. (02-04-2018 07:26 AM)PANAMATIK Wrote: Nobody has discovered the hidden feature yet. Hm... but shouldn't be too difficult. I'm not fully done with mine yet. Connection of the GPS is still missing because initially I couldn't find a place for it inside the calculator and had to remove some parts first. Then I was away for work almost all week. But this afternoon maybe... Should I ever convert another Woodstock to a Panamatik LP version I will remove all the old parts first. This makes installation of the new components quicker and easier I guess. While I was away last week an HP-37E arrived in the mail. Bought cheap as defective but I have not looked into it yet. It's by far the best looking calculator of that series that I have seen so far - it really looks like new. No cracks in the plastic, almost no corrosion around the battery contacts. In case it can't be revived, would there be a chance to somehow retrofit it with an LP board? If the keyboard matrix and LED connection would be similar it would just be a matter of wiring - or not? (02-04-2018 09:42 AM)Maximilian Hohmann Wrote: ... would there be a chance to somehow retrofit it with an LP board? If the keyboard matrix and LED connection would be similar it would just be a matter of wiring - or not? I never tried that, or even had this idea. But principally if you remove the original parts of a "Spice" calculator there should be space for the LP board somehow. The software could be adapted to the smaller LED display, which has only 11 digits. I know that the display principally is compatible, because it is also a common cathode 7-segment display. Also the keyboard is a 5*7 Matrix like in the "Woodstocks". This way an HP-34C could be repaired and the unreliable solderless hardware could be replaced. But 26 wires have to be connected manually. (02-04-2018 10:52 AM)PANAMATIK Wrote: But 26 wires have to be connected manually. Luckily I don't have to do that right away because that "defective" HP-37E is not defective at all :-) It just has some corrosion around the PCB traces that serve as contacts to the charger. When powered from my laboratory power supply it works perfectly well. Almost... because after some minutes several display segments went out. As if warming up made it lose contact somewhere. Should be a matter of opening the housing and resetting the connectors - but not today, the LP calculator comes first. Almost there: The on-Off key works, the buzzer works, most of the functions I tried work like date/time/stopwatch/ticker text. The IR printing I could not try yet because I have to find a printer first (buried somewhere in a pile of boxes). But my GPS does not work... 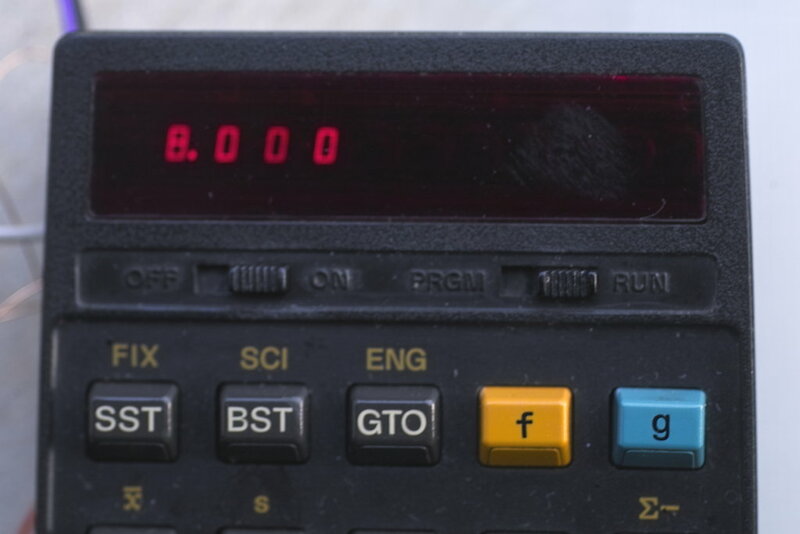 When I press "g STO" all display digits flicker for a second as if a program were running and thereafter it returns to display "0.00" but does not react to the keyboard until I disconnect the power. Also a second "g STO" will not get it out of that GPS mode. I measured the voltage at pin 1 of the GPS module (connected to Vout of the Polulu step-up converter) and briefly see 3,3V (my power supply itself is set to 2,5V) but it drops back to zero after about a second. (02-04-2018 04:24 PM)Maximilian Hohmann Wrote: Almost there: The on-Off key works, the buzzer works, most of the functions I tried work like date/time/stopwatch/ticker text. The IR printing I could not try yet because I have to find a printer first (buried somewhere in a pile of boxes). The initial current of the switching regulator is very high for some ms. Seems that your power supply has a current limitation? Try a normally charged battery instead. The GPS module does not work properly when batteries are discharged below 2.4V battery voltage. (02-04-2018 04:52 PM)PANAMATIK Wrote: Try a normally charged battery instead. 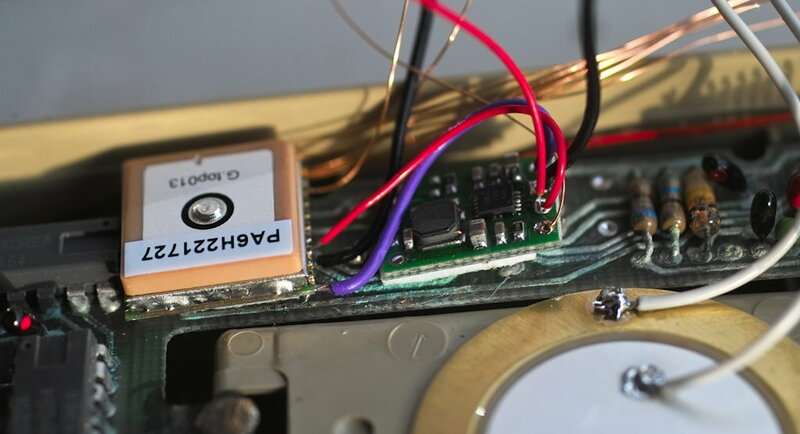 I never tried to place the GPS module here, it seems to be a good place, because it is more easy to remove the discrete components, than to remove the ACT and RAM chips for placing it there. But it could be necessary to remove the ACT chip anyway, I got some feedback that it consumed 2 mA while in sleep mode when the ACT is not removed, drawn presumably via the keyboard lines. You can fix the beeper also to the keyboard PCB and of course using some thin tape for isolation. Then it is more easy to separate the electronics from the case when opening. (02-04-2018 06:01 PM)PANAMATIK Wrote: But it could be necessary to remove the ACT chip anyway, I got some feedback that it consumed 2 mA while in sleep mode when the ACT is not removed, drawn presumably via the keyboard lines. Mine drew almost 17mA when in sleep mode! I now proceeded and removed all easily accessible components from the board (namely the ACT and the RAM/ROM chips but also the remainder of the switching power supply). Only a few parts around the display now remain in place, some resistors and a diode I think. But it still draws constant 5mA in sleep mode. What can that be? I disconnected the hotwired "+" from both the GPS module (where it preserves the last position in memory and maybe also keeps the clock running I suppose) and the voltage converter but there was no noticeable difference. And I am still not able to get a GPS fix. I tried to keep it running for long enough but it always turned the GPS off by itself before it could get a valid position. To cope with the initial current draw of the voltage converter I even soldered a 5.5V 1F supercapacitor/"gold cap" across the battery contacts but this made no difference. For batteries I now use a pair of lightly used alkalines which the calculator itself measures with 2,9V. Anything else I can try here? (02-05-2018 04:36 PM)Maximilian Hohmann Wrote: Anything else I can try here? Difficult to know what the problem could be. One strange bug has occurred several times now, I think (qualified bug reports are different, I know, but I have yet to understand the pattern behind it...) it happens when the GPS is, or was, turned on and the calculator goes into sleep mode. and the calculator will not react to any key or switch any longer. It can only be brought back by disconnecting the battery. When I used the calculator without turning on the GPS this never happened. (02-11-2018 04:59 PM)Maximilian Hohmann Wrote: ... it happens when the GPS is, or was, turned on and the calculator goes into sleep mode. ... When I used the calculator without turning on the GPS this never happened. Turning ON the 3.3V GPS switching power supply draws high initial current for some ms, this can affect the circuit if the batteries are relatively low. I think this could be avoided by an external 100uF capacitor between Bat+ and GND near the LP circuit power pins. The hidden feature, not described in the LP manual has been discovered. Congratulations to BobVA. I will not uncover it here, perhaps it is fun to find out for others. Now another issue: Usually I offer to asssemble the LP circuit into a calculator without costs if someone doesn't feel to have enough soldering experience. He has just to send the calculator to me. This week I received an HP-25 calculator, which is in absolutely pristine condition. The keyboard is clean, the calculator is working and has a crisp display.The rubber feet are like new after 40 years. The case color is bright as you expect when buying it from the store in the 70s. 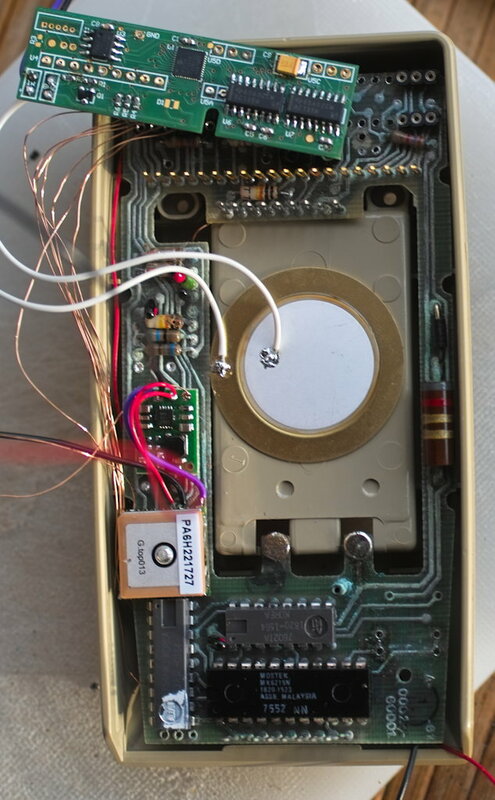 Normally the LP circuit as well as the new ACT is meant to repair a Woodstock calculator. I think about to offer the LP circuit assembly only if the target is a defective unit. Defective or cosmetically poor. The one sent to you seems way too good and collectable to convert. But please send me the pristine hp-25 and i’ll Gladly replace with one that came through a house fire! (02-14-2018 10:09 AM)PANAMATIK Wrote: I think about to offer the LP circuit assembly only if the target is a defective unit. How about this: See if the owner will accept another (failed) board that you've revived with the LP module, and let you keep the working one? Then you can keep that original board as a repair/restoration spare. As for the physical condition, I just moved my LP board to my nicest looking HP-25. I'm using it as my day-to-day calculator and *really* enjoy seeing it on my desk, more so than a banged-up example. I think installing the LP board in a working Woodstock raises a conundrum similar to the "resto-mod" vintage car decision: Is it better to have a perfect example of something from the past to look at, and use sparingly if at all? Or do you want to experience the excellence of that old design coupled to modern technology that makes it as good or better than something new, transforming it into something practical to use every day? But, unlike a car, "restoring" it is as simple as swapping in the old logic board.